Boeing is pleased that Singapore Airlines has announced its commitment to purchase 20 777-9s and 19 787-10 Dreamliners. The national carrier and 787-10 launch customer also announced its recommitment for its previous order for 30 787-10 airplanes. The 787-10 is the third member of the super-efficient, passenger-pleasing 787 Dreamliner family. With its greater passenger and cargo capacity, high degree of commonality and passenger-pleasing features. This entry was posted in Singapore Airlines and tagged Boeing, Boeing 777-9, Boeing 787-10, Singapore Airlines on February 9, 2017 by Bruce Drum. Boeing (Chicago, Seattle and Charleston) has completed detailed design for the 787-10 Dreamliner, achieving another major milestone in the development of the newest and longest member of the 787 family. Boeing engineers reached the key milestone nearly two weeks ahead of schedule. This entry was posted in Boeing and tagged 787, 787-10, 787-10 Dreamliner, Boeing, Boeing 787, Boeing 787-10 on December 3, 2015 by Bruce Drum. Boeing (Chicago, Seattle and Charleston) and EVA Airways (EVA Air) (Taipei) today finalized a historic order for up to 24 787 Dreamliners (18 787-10s and 6 787-9s) and two 777-300 ER (Extended Range) jetliners (below). The order, valued at more than $8 billion at current list prices, marks the largest single commercial airplane purchase in Taiwan aviation. Top Photo: Boeing. EVA President Austin Cheng and Boeing Commercial Airplanes President and CEO Ray Conner show off a model of the 787-10 in the new livery just announced. Below Copyright Photos: Manuel Negrerie/AirlinersGallery.com. EVA Airways continues to modernize its long-haul fleet to replace aging aircraft and plans to grow its fleet to more than 100 units by 2020. These new 787-10 Dreamliners will allow the airline to expand into new markets. They will be deployed on medium-range and long-haul flights and will be operated in tandem with the 777-300 ERs to form the backbone of EVA Airways’ fleet. EVA Airways’ 777-300 ER fleet continues to grow and the carrier is the world’s eighth largest 777-300 ER operator in the world and fourth largest in Asia. Bottom Copyright Photo: Royal S. King/AirlinersGallery.com. Brand-new Boeing 777-35E ER B-16725 (msn 44554) displays the new 2015 livery for the expanding carrier. This entry was posted in EVA Air and tagged 44554, 777, 777-300, 777-35E, 787, 787-10, B-16725, Boeing, Boeing 777-300, Boeing 787, Boeing 787-10, EVA Air on November 24, 2015 by Bruce Drum. 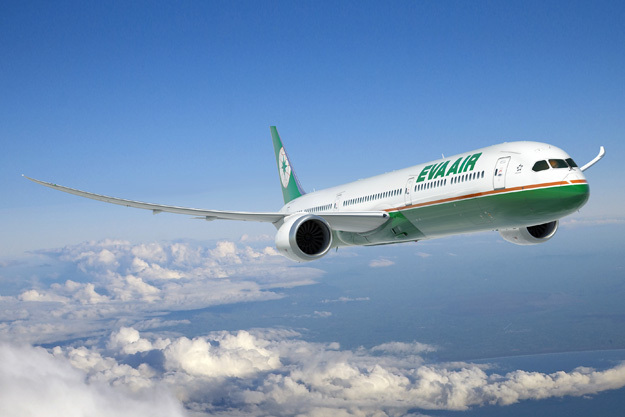 EVA Air (EVA Airways) (Taipei) intends to purchase up to 24 Boeing 787-10 Dreamliners and two additional 777-300 ER (Extended Range) jetliners, which is valued at more than $8 billion at current list prices. EVA Airways will join the 787-10 launch customer team and will be one of the first airlines in the world to introduce the newest member of the 787 Dreamliner family. Once the deal is finalized, Boeing will post the order on the Boeing Orders and Deliveries website. The airline currently operates more than 37 Boeing airplanes in its fleet, including 21 777-300 ERs. The 777-300 ER is the backbone of EVA Airways’ growing fleet and the carrier is the world’s 8th largest 777-300ER operator and 4th largest in Asia. 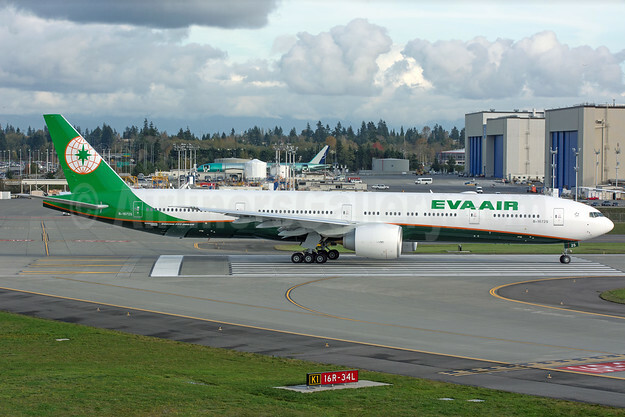 With its intent to purchase two additional 777-300 ERs as part of this deal, EVA Airways will have unfilled orders for 15 777-300 ERs and five 777 Freighters, as well as 24 787-10s – both direct purchased and leased. This entry was posted in EVA Air and tagged 787, 787-10, 787-10 Dreamliner, Boeing, Boeing 787, Boeing 787-10, Boeing 787-10 Dreamliner, Dreamliner, EVA Air on October 16, 2015 by Bruce Drum. 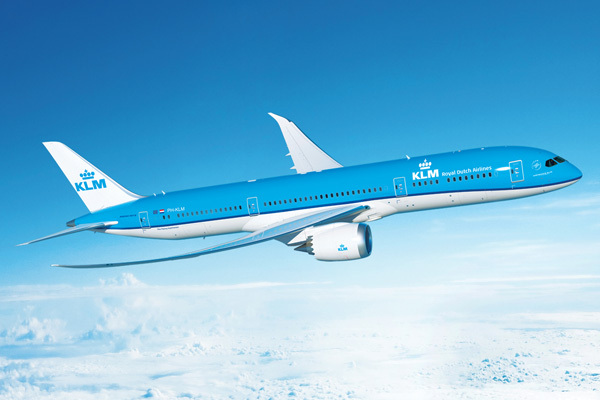 KLM Royal Dutch Airlines (Amsterdam) has changed its order for six Boeing 787-9s to the larger 787-10. According to the carrier, this is not an additional order. The aircraft are expected as of 2020. This entry was posted in KLM Royal Dutch Airlines and tagged 787, 787-10, 787-10 Dreamliner, Boeing, Boeing 787, Boeing 787-10, Dreamliner, KLM Royal Dutch Airlines on August 20, 2015 by Bruce Drum.